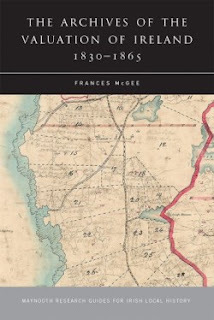 The latest publication in the highly-regarded Maynooth Research Guides for Irish Local History series is the Archives of the Valuation of Ireland, 1830-1865, by Frances McGee. The author worked as an archivist in the National Archives of Ireland (NAI) for forty years and was its Acting Director at the time of her retirement in 2014. She has now written an extensive and thorough guide to assist researchers understand one of the NAI's more complex collections. Between 1830 and 1864, every piece of property in Ireland was valued, from houses on tiny plots of land to the great landed estates. The work of valuation created a large volume of archives that recorded the occupiers of land and houses as well as details of the location, extent and quality of their property. The Valuation archives date from a period when few sources cover the whole country and are a rich resource for research ranging from family history to socio-economic study. Published by Four Courts Press, the 240-page colour-illustrated paperback is now on sale for €17.95 from the publisher, and from other booksellers. ISBN: 978-1-84682-136-3.